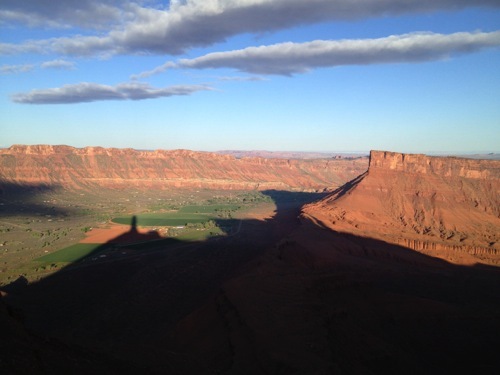 One of the most distinguishing features of the Moab desert is the enormous sandstone towers which stand proudly atop their bases like ancient sentinels. To the vertically inclined, these pillars represent the ultimate challenge, and an unsurpassed sense of accomplishment. 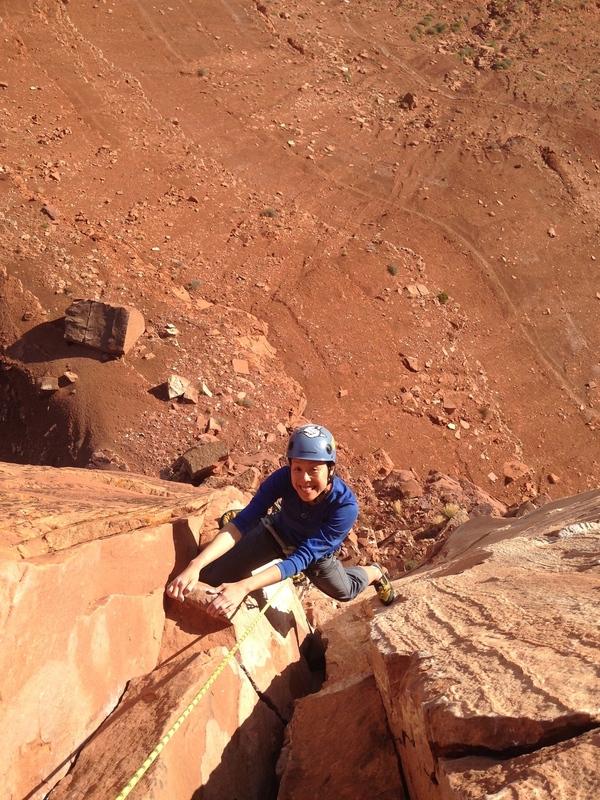 The AMGA-certified guides at Moab Desert Adventures have the experience and expertise to help you reach these incredible summits, and our advanced climbing skills allow us to offer a wider array of options than any other service in the region. Below are some of the towers that we guide, but not all. If you have something specific in mind, such as a larger group of people, a different tower, or perhaps a link-up of two or more towers, please contact us for details! Check out this amazing footage! A perfect first tower! With nearly 500 feet of exposure, and four awesome pitches of diverse climbing, Ancient Art's corkscrew summit is a journey you won't forget. As a great introduction to tower climbing, the grade of 5.8 reflects the vast majority of the climbing, with the more difficult moves being easily bypassed. The classic summit pitch requires a delicate walk across a narrow ridge to the "diving board," the price of entry to the corkscrew summit and a dinner- tray-sized perch above one of the area's most spectacular desert landscapes. Standing fully up on the summit is surreal! Ancient Art is truly one of the most fun (and outrageous!) 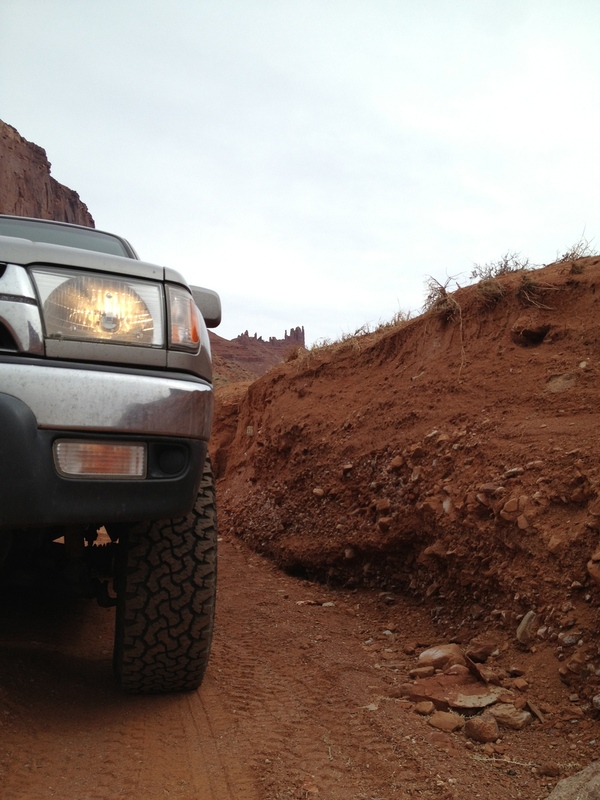 tower climbs in the Moab area. You can also check out this video of MDA's owner, Nate, guiding two journalist friends if you’d like to see more of the climbing on the tower. Castleton Tower, the centerpiece for our logo, is a fitting representative of tower climbing at its best. Standing alone overlooking a hundred miles of desert and sky, it is a perfect tower. This four hundred foot sandstone giant presents a wonderful day-long adventure that involves an exhilarating approach, four to five pitches of challenging crack and face climbing, and one of the finest summits in the world. The most popular routes to the top are the Kor-Ingalls (5.9) and the North Chimney (5.9), both of which offer the various array of quintessential blue-collar crack climbing. If you're up for the North Face, you'll be in for one of the finest 5.11 crack routes in the region. Either way, you'll certainly feel the effort after this one! Sister Superior, yet another in the classic Castle Valley tower lineup, rises four hundred feet to a pointed summit that is a mere fifteen feet wide. The climbing presents a higher level of difficulty (5.10), requiring both face and crack climbing at that level. The first pitch of "Jah Man" is one of the most enjoyable chimneys in the desert. The second, crux pitch brings things up to speed with several hard face climbing moves past a roof, easing into a super enjoyable handcrack. Depending on your hand size, you may consider the third pitch to be the crux with its thin splitter crack. A historic bolt ladder, with old relics right next to new shiny bolts leads to the summit. Three long rappels bring you home again. Jah Man is one of the area's best tower routes, with amazing exposure, and sustained climbing. As one of the absolute best chimney pitches in the desert, with a crazy bolt-protected upper face section, Honeymoon Chimney certainly provides climbers with a very unique and unforgettable experience. Honeymoon Chimney is a four pitch route that can be climbed at 5.9 with a short section of aid (or 5.11 without!). This is old-school (1961) 5.9 though, so expect fully 5.10 effort! This route is great fun and the variety of climbing on it will test your desert climbing skills. There is off-width, tunneling, wild stemming, and face climbing, all bringing you to yet another amazing summit where you can soak up the never ending landscape. The Priest is a great climb to take on if you've already done some of the other resident classics on Castleton and/or Sister Superior. Located just south of Moab, Looking Glass Rock is a huge sandstone dome, with a massive church-like amphitheater carved out of the heart of the rock by the passing of wind, water, and time. Carved out of the western wall of this amphitheater is a window, overlooking the vast expanse of canyonlands country beyond. A trip to Looking Glass Rock is a real delight, and a great one to do with the family. The climb is a 3 pitch route up the low-angled east ridge of the dome. There are a couple of moves of 5.6 here and there, and the rest is a mellower excursion to the summit. Here you can sign the summit register and enjoy the 360 degree vistas. One of the highlights of the outing comes with the rappel. The free-hanging, 35 meter rappel takes you down inside the amphitheater, and is exhilarating to say the least. It is possible to take a group larger than 3 people, so please call us for details, and check out this video one of our guests made!